Centre National d'Art et de Culture George Pompidou and Musee Rodin will appeal to museum buffs. Get outdoors at Seine River and Île de la Cité. Go for a jaunt from Paris to Versailles to see Palace of Versailles about 48 minutes away. And it doesn't end there: make a trip to Eiffel Tower, admire the landmark architecture of Basilique du Sacre-Coeur de Montmartre, steep yourself in history at Cathédrale Notre-Dame de Paris, and head off the coast to Ile Saint-Louis. 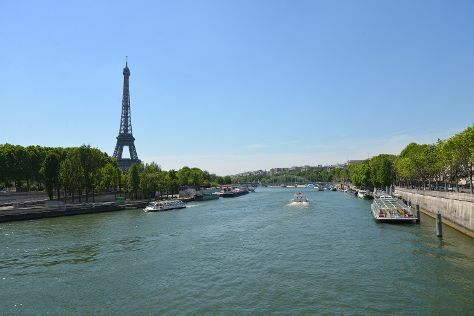 For where to stay, photos, more things to do, and more tourist information, use the Paris day trip planning website . If you are flying in from Brazil, the closest major airports are Paris-Orly Airport, Charles de Gaulle International Airport and Paris Beauvais Tillé Airport. In July, plan for daily highs up to 30°C, and evening lows to 18°C. You will have some time to spend on the 9th (Tue) before leaving for home.